Halloween jack-o-lantern at the Hookipa pillbox, plus a sign: "GMOs R Scarey" and so is bad spelling! Pic taken 11/21/13. GMOs are and have been a controversial issue in the world, but also in Hawaii because Monsanto grows GMO test crops here. I've written about Jaws many times. It's an extreme surfing spot that attracts professional athletes from all over the world, and lots of spectators. The spectators often get lost trying to find their way to Jaws. Jaws is kind of like the Emerald City in the Wizard of Oz. It's elusive to find if you don't know where to go. 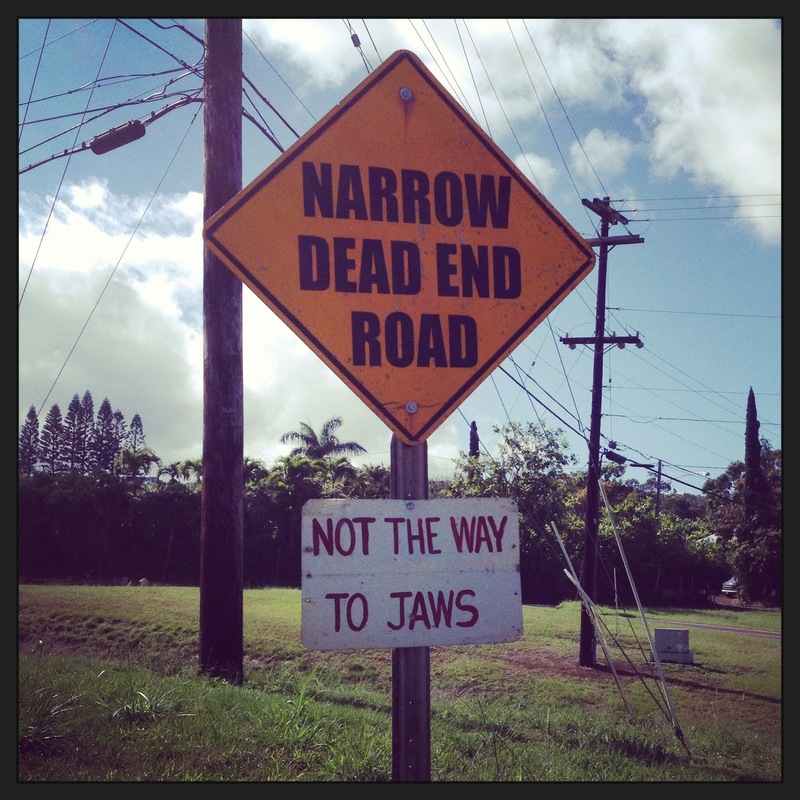 Luckily, some kind people posted this sign: "Not the way to Jaws." They probably got tired of people walking across the lawn. This is a temporary piece of street art. It's seasonal, and is posted near Peahi, where Jaws is located, right after Thanksgiving and then removed in January. This is Santa surfing at Jaws. He's called "Tow-in Santa" because to catch those waves, Santa needs a jet skier to tow him in. So do all the other professional surfers at Jaws. John Torres of Haiku painted this Santa and his father painted some other Santas. It makes quite a display at Christmas.